Gaius Julius Caesar (13 Julie 100 BC – 15 Mairch 44 BC) wis a Roman general an statesman. He played a critical role in the gradual transformation o the Roman Republic intae the Roman Empire. In 60 BC, Caesar entered intae a poleetical alliance wi Crassus an Pompey that wis tae dominate Roman politics for several years. Thair attempts tae amass pouer for themselves throu populist tactics wur opposed athin the Roman Senate bi the conservative elite, amang them Cato the Younger wi the frequent support o Cicero. Caesar's conquest o Gaul extendit Roum's territory tae the North Sea, an in 55 BC he conductit the first Roman invasion o Breetain. These achievements grantit him unmatched military pouer an threatened tae eclipse Pompey's standin. The balance o pouer wis further upset bi the daith o Crassus in 53 BC. Political realignments in Roum finally led tae a staund-aff atween Caesar an Pompey, the latter haein taken up the cause o the Senate. Ordered bi the senate tae staund trial in Roum for various chairges, Caesar mairched frae Gaul tae Italy wi his legions, crossin the Rubicon in 49 BC. This spairked a civil war frae which he emerged as the unrivaled leader o the Roman warld. Efter assumin control o govrenment, he began extensive reforms o Roman society an govrenment. He centralised the bureaucracy o the Republic an wis eventually proclaimed "dictator in perpetuity". A group o senators, led bi Marcus Junius Brutus, assassinatit the dictator on the Ides o Mairch (15 Mairch) 44 BC, hopin tae restore the constitutional govrenment o the Republic. Housomeivver, the result wis a series o civil wars, which ultimately led tae the establishment o the permanent Roman Empire bi Caesar's adoptit heir Octavius (later kent as Augustus). Muckle o Caesar's life is kent frae his awn accoonts o his military campaigns, an ither contemporary soorces, mainly the letters an speeches o Cicero an the historical writins o Sallust. The later biographies o Caesar bi Suetonius an Plutarch are an aa major soorces. 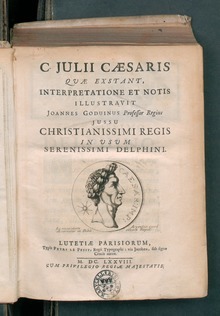 ↑ Fully, Caius Iulius Caii filius Caii nepos Caesar Imperator ("Gaius Julius Caesar, son o Gaius, grandson o Gaius, Imperator"). Offeecial name efter deification in 42 BC: Divus Iulius ("The Divine Julius"). Wikimedia Commons haes media relatit tae Iulius Caesar.